All paddlers must sign the participant waiver in order to paddle. The waiver is a part of the registration process, but is invalid for paddlers under 18 years of age due to the fact that the parent/guardian must sign the waiver. Please download the waiver here and either email it to rabbott@urbanpromiseusa.org or bring it with you on the day of the paddle. 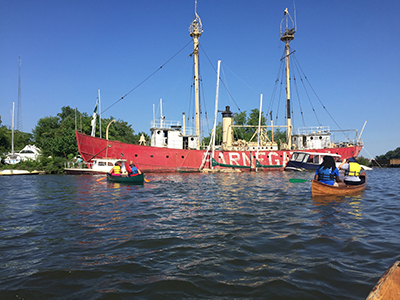 Join us on a youth-led guided paddling trip down the tidal Cooper River through Camden to learn about the fascinating ecological and industrial history of this piece of the Delaware Watershed. The route finishes with stunning views of the Philadelphia skyline from the back channel of the Delaware River. Throughout the summer, each trip is led by our trained RiverGuides, all of whom are Camden youth. The trip is fully outfitted with boats and equipment. Contact Rachel Abbott to learn about additional environmental education paddling field trip opportunities and private tours for your students, after school program, or conservation group. Please note: at present, our group maximum for paddling trips is 15 participants. If your group is larger than 15 individuals, please contact our office directly to inquire about scheduling an alternate experience or event. Also, all paddlers under the age of 16 must be accompanied by an adult. UrbanPromise offers its Ecology History Paddle program to the public, including those living in- and outside Camden City. All participants must register at least 24 hours prior to the launch. Contact Rachel Abbott to schedule a paddling trip for your group. Registration books up quickly, so if you want to reserve a date for your group, Rachel know! A River Homecoming: Rediscovering the Cooper River from UrbanTrekkers on Vimeo.